The most ancient myths of India tend to have a magical, timeless quality. Do they happen in this world, in another world? In this time? Or perhaps in all time, or no time? Do they simply transcend our limited, prosaic awareness of the nature of time? Vrindivan is a town in Uttar Pradesh where it is said that Krishna passed the days of his childhood. There, the Yamuna River is the second largest tributary of the Ganges. It originates from the Yamunotri Glacier in the Himalayas, at a height of 20,000 feet. It flows through several states and eventually merges with the Ganges. A long time ago, an ancient story goes, a serpent king, Kaliya, had fled from his original home because he was afraid of Garuda, the great eagle or kite who is the enemy of all serpents. Garuda could not go to Vrindivan because of a curse that prophesied that he would meet his death there, so Vrindivan was a good place for Kaliya to live since his mortal enemy could not come there. One day when the young boy Krishna and his friends were playing ball by the river bank, and Krishna had climbed up a Kadamba tree that was hanging over the river, the ball fell into the river and Krishna jumped into the water after it. Now Kaliya was a naga, a great serpent who lived in the river. Disturbed by this sudden intrusion of the boy Krishna jumping into the river, Kaliya’s giant head rose up above the surface of the water. A vile poison flowed out of his 110 hoods, poisoning the river and turning it black, killing the fish and all life in the river. Kaliya wrapped himself around Krishna to strangle him, but, unexpectedly, Krishna grew bigger and bigger. He became so huge that Kaliya finally had to release him. When Krishna glanced at the people on the riverbank and saw that they were very frightened, he knew he had to do something. He leaped into Kalia’s head and took on the weight of the whole universe, then he danced on the naga’s many heads, in time to the beat of the music. Kaliya began to die, and his many wives prayed to Krishna for their husband to be saved from death. At this moment, Kaliya came to his senses, and, acknowledging the power of Krishna, he surrendered, promising not to hurt anyone ever again. Krishna forgave him and let him go free, to return to his original home, Ramanaka Dwipa. So ends the tale. Is this a story of the past, the present, the future – does it spell out a warning? It is hard not to see in it a story of pollution — of polluted, lifeless rivers, which belong very much to our own time – of great black snake-like oil worming it’s way downsteam from one of those endless oil spills that, of course, can never really happen because the pipelines are “perfectly safe,” and we are informed that we are being quite silly to worry that they might be hazardous. There is, however, a deadly spill; then Krishna, the essence of life and goodness vanquishes the pollution, sending it back to where it belongs and freeing the river from its grasp of death. All ends well. This story, it seems, is a timeless one, of multi-layered meaning – of the past, the future, the present – of all time – of the physical world and the transcendent, spiritual world. Not just an odd tale from the distant past, but instead a profoundly relevant story of eternal truth – of the reality of evil and also of the recurring victory of good over evil. The combattants “blew their loud-sounding conches and cymbals of sweet sounds…a frightful dust arose and nothing could be seen, for the sun himself, suddenly enveloped by it, seemed to have set….both armies, filled with joy, stood addrest for battle, on Kurukshetra like two agitated oceans.” At the start of the Kurukshetra war, recounted in the Mahabharata, two armies stood poised on the battlefield. The Mahabharata is one of the two great epic poems of India. It is long – eighteen volumes, and much of it deals with a great war that lasts eighteen days. It is a civil war fought between two branches of a royal family – the Pandavas and the Kurus. The Pandavas are the five sons of King Pandu, who has died, and the Kurus are the one hundred sons of King Dhritarashtra, who cannot rule because he is blind, and the customs of the time forbid him from ruling. There has been much speculation about when in history this war may have occurred, with estimates ranging from 5,000 BCE to around 600 BCE. No one knows for sure. The entirety of Book Five is an account of the peace efforts that take place before the beginning of hostilities, as representatives of the Pandavas tried unsuccessfully to arrange a truce in order to avoid bloodshed. The Pandavas did not want to fight. Duryodhana, prince and leader of the Kurus insisted on war. The Pandavas were closely related to the Kurus. They had grown up in the same family. Although the Pandavas, by right, could have demanded half of the lands claimed by the Kurus, which comprised a large part of India, they asked only for five villages – a tiny request – one village for each of the five Pandava brothers. It may seem odd that a village should belong to someone, but this was a feudal system, not unlike the feudal system in medieval Europe where the people, villages, and lands belonged to the lord of the domain. In any case, the Pandavas asked for only five villages, but this request was denied, and the Kuru leader, Duryodhana, was bent on going to war. This followed many years of unfair and unjust treatment that Duryodhana had inflicted on his cousins, the Pandavas. Even the divine Krishna himself traveled to Hastinapura, the city of the Kurus, to make a plea that this war should not be fought, that there should be peace, and that the two branches of the family should rule the great kingdom together in harmony. The olive branch that he extended was rejected. With all attempts at reconciliation having failed, war was now inevitable. Seeing that they had to fight, all the young warriors turned their attention to boasting about how they would vanquish the enemy. They were at this point, eager for battle and confident that the victory would be theirs. The next morning at dawn, they would begin the battle. Both sides anticipated victory and looked forward to a good fight. This was not a small war. Hundreds of thousands of warriors traveled from all the corners of India and beyond to take part in the war. They brought with them many thousands of war elephants and horses, who, sadly, would also be wounded and killed in the fighting. One by one they died during the ascent up the mountain, until, at the summit, only the just King Yudisthera, the eldest of the Pandava brothers, remained alive. A little dog had accompanied him on his way up the mountain. On the summit of the mountain, he was offered the chance to ascend to heaven, but only if he went on alone, abandoning the dog who had followed him so faithfully. 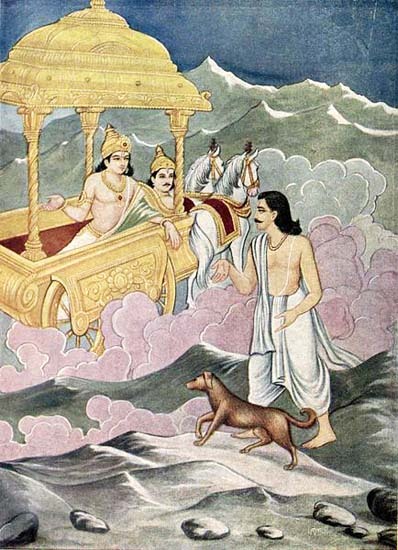 Yudisthera declined, refusing to enter heaven if his dog could not come with him. Then the dog revealed himself as the Lord of Dharma or righteousness. This had been a test of Yudisthera’s loyalty. He had passed the test, and he and his dog entered heaven together. His four brothers and Draupadi who had already died, would follow them into heaven as soon as they had fulfilled their karma. The war of the Mahabharata brought the end of the great cosmic age, the dvapara yuga, which was an age when heroes, courage, and noble values still existed. The ending of the war ushered in the current age, an age of degeneration and corruption, which is the time we live in today. There is much more, of course, to this story, which fills eighteen volumes. It is a story relevant to all times and places. As the story of a terrible war that ended in immense calamity, it is perhaps particularly relevant today. Despite every effort of the Pandava princes to prevent a conflict that would end in disaster, they were drawn along relentlessly by the inexorable forces of war which they could do nothing to stop. 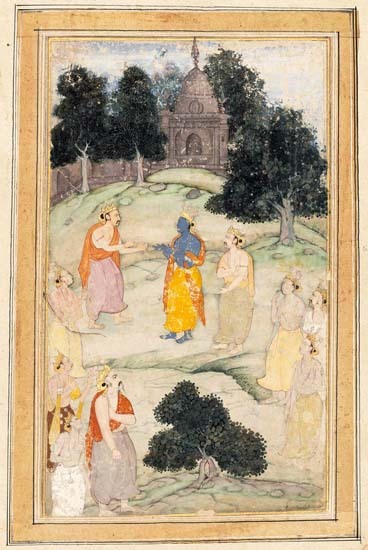 Second image: Source: http://www.mfa.org/collections/object/krishna-mediating-between-the-pandavas-and-kauravas-from-an-illustrated-manuscript-of-the-razmnama-mahabharata-148638 / Wikimedia Commons / “This image (or other media file) is in the public domain because its copyright has expired. “This applies to Australia, the European Union and those countries with a copyright term of life of the author plus 70 years. 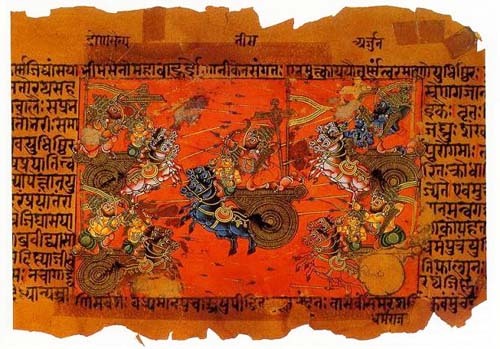 Third image: Source: http://archive.org/details/mahabharata06ramauoft / Author: Ramanarayanadatta astri / “This image (or other media file) is in the public domain because its copyright has expired. “You must also include a United States public domain tag to indicate why this work is in the public domain in the United States.” / Wikimedia Commons / Yudisthera ascending to heaven with his dog.